This week I will be reviewing Mac Rogers’ play Frankenstein Upstairs. Before the review posts tomorrow, I am putting up a series of “Pre-Game” posts, where I talk a little about the Mac Rogers plays I’ve covered before and how perspective figures into each of them. You can read the first part, about Rogers’ play Universal Robots, here. 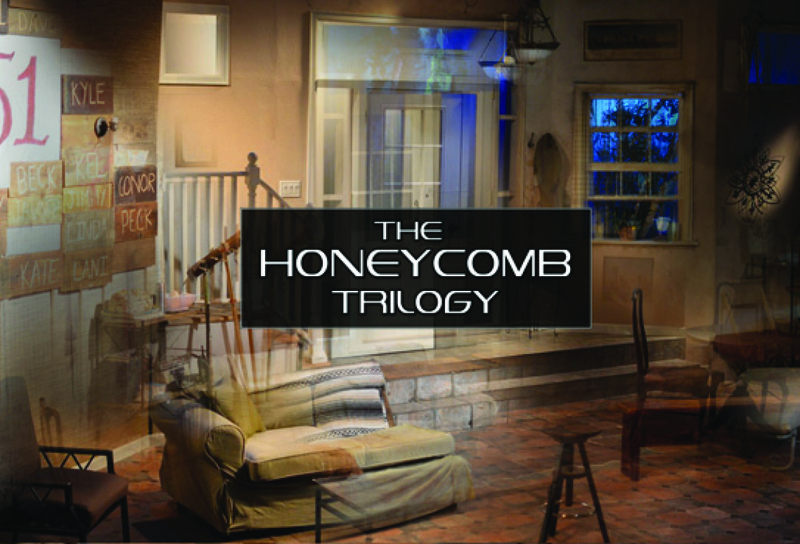 Throughout 2012, Gideon Productions presented the full cycle of Rogers’ The Honeycomb Trilogy at the Secret Theatre in Long Island City. I covered each of the plays that make up this magnum opus about an alien invasion for Backstage: Advance Man, Blast Radius, and Sovereign. 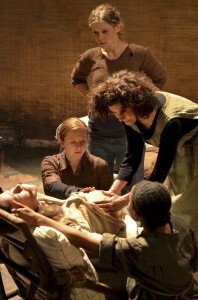 Praise for all three parts was essentially unanimous amongst the key New York review outlets, and Advance Man won the New York Innovative Theatre Award for Best Premiere Production. As with Universal Robots, Rogers’ most slyly effective tool in presenting such a remarkably authentic alien invasion in The Honeycomb Trilogy is, again, in its viewpoint. In Advance Man we meet the Cooke family: former astronaut father Bill, devoted wife Amelia, and the children Ronnie and Abbie. We spend the majority of Advance Man confronting minor domestic issues in the living room of their affluent Florida home; it is quality character and relationship building time that proves crucial in Parts 2 and 3. Particularly affecting and important is the early relationship between brother and sister Abbie and Ronnie, depicted with such unaffected sincerity by performers David Rosenblatt and Becky Byers. As their gender-swapped names suggest, Ronnie is the more aggressive, outspoken personality, consistently getting into trouble at school for fighting and sneaking around with boys. Abbie, however, is a quiet, confused boy content to draw and make up stories when he isn’t being picked on at school. Certainly the best scene in Advance Man occurs when Ronnie and Abbie cross paths late one school night, as she quietly reenters the house after fooling around with some guy. Her guilt obvious, Ronnie suffers a barrage of harangues from the usually timid Abbie, who has been emboldened by having the upper hand in this situation. But this playful conversation about “finger blasting” and Ronnie’s other adolescent sexual antics is really a kind of smokescreen. Abbie is clearly a young man who has done a lot of thinking about his own sexuality, but hasn’t quite figured out how to talk about it. 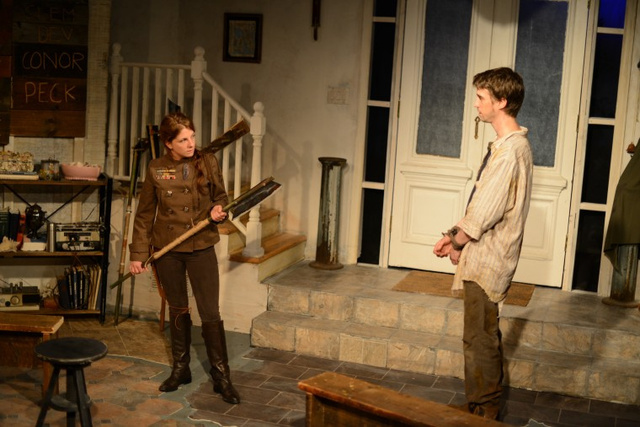 In a private conversation early on in the play, Bill and Amelia wonder when their son will realize that he is gay. Sean Williams and Kristen Vaughan were both spectacular in this scene, and Rogers’ writing is at its sneaky best. The delicate situation feels so true-to-life and gives the audience so much reason to invest in this family emotionally that we have all but forgotten the ominous meetings Bill keeps taking with his old Mars mission crew. Regardless of what type of ecological terrorism they are planning, we are invested because we know on a macro level that Bill only wants to do right by his family. We continue to care about the family even after it comes out that Bill is terraforming the Earth to make it hospitable to a race of telepathic insectoid aliens, who he believes will do a better job of managing the planet than humans have. Most importantly, thanks to this early intimacy with the Cooke family, we continue to care about them after this invasion happens. Blast Radius and Sovereign both take place post-invasion. We come to understand that all technology and remnants of modern society have been purged from the world by the aliens, but our view remains cunningly restricted to Sandy Yalkin’s terrific set of the ever-evolving Cooke family living room throughout. 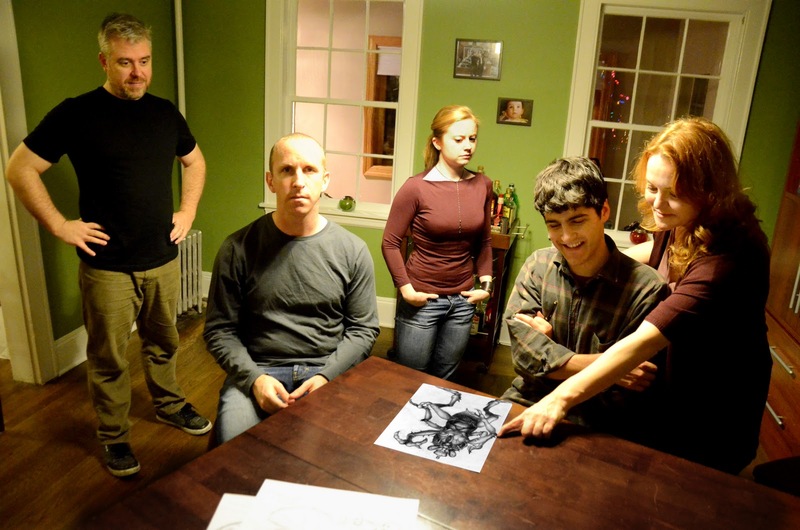 Blast Radius is set twelve years after Advance Man, when the Cooke house has been rejiggered to serve as a human “birthing house.” The conquering aliens – who now centralize their collective intelligence in “honeycombs” throughout the world – depend on mankind for slave labor. Only pregnant women are given a reprieve, and mostly because our messy mammalian live births give the big bugs the screaming heebie jeebies. With her visionary father long dead and her mother drifting into senility, Ronnie has concocted a plan to take the planet back from the bugs by destroying the nearby honeycomb. Knowing that the birthing house is the one place the bugs will never dare go, she manages to stay pregnant and thus is able to lead an insurgency from the place that was her childhood home. Her brother Abbie has sided with the aliens as an ambassador, even taking Connor, an alien who telepathically overrode the mind a human, as his lover. Abbie believes that overriding the minds of every human on Earth, including his own, and putting them under the control of the honeycomb will simplify things. In Advance Man, we saw two sides of adolescence via Ronnie and Abbie and now we see two sides of an unthinkable war, where each of them must make sacrifices to survive. Ronnie’s rebellion succeeds and soon the aliens are all but overthrown worldwide. In the final play, Sovereign, Ronnie has become the feudal governor of the territory that was once her Florida hometown. Years of fighting the aliens have shaped her into an autocratic ruler, completely without mercy. Abbie turns up on Ronnie’s turf, and she vows to try him for his attempted genocide in Blast Radius. His ad hoc trial takes place in the governor’s office, established right in – you guessed it – the shabby remains of the Cooke family living room. The highly charismatic Hanna Cheek and the vigilant Stephen Heskett took over the roles of Ronnie and Abbie for the final installment, and it’s a testament to their performances and the reliable quality of director Jordana Williams’ three productions that the transition is seamless. As these estranged siblings confront each other in the very room where they once joked about “finger blasting,” we suddenly feel the weight of the world shift. Ronnie and Abbie and the Cooke home were once incidental; just a window through which we experienced the larger, frightening world. First, their home protected them from the abstract terrors of adolescence and looming adulthood, and later from the very real menace of the alien occupation. Now, with Ronnie the world’s most powerful leader and Abbie its most infamous criminal, their conflict is what the rest of the world needs to be protected from. And so, Rogers’ wrenches the magnificent domestic perspective that has been the hallmark of the Honeycomb Trilogy inside out. Society beyond the Cooke living room has crumbled into moral decay and whatever decision is made in this room between these two people will surely set the precedent for the rest of the world. If the seemingly heartless Ronnie condemns her brother to death, we understand that notions of love, family, and forgiveness – notions that belong to the pre-alien world of Advance Man – will be lost forever.